From outlaying over 500 AED at a lavish brunch to tumbling 10,000 AED on your beloved club’s table; Dubai is fearless of flashing cash. The city has a reputation of being splendidly luxurious and extravagant, and seems to be impractical for someone who is not a millionaire. The flashy clubs, bars, hotels, restaurants and shopping malls of this flamboyant emirate are rather expensive; yet the remnants of the old Dubai city and a trickle of other spectacles keep economical and frugal travelers entertained too. We have already covered some of the best and exciting activities in Dubai and in this article we will highlight things which you can do on budget or free in Dubai. Dubai is unquestionably an ostentatious location and to enjoy at the fullest, you must have money in your pockets. However, this place offers a wide assortment of activities ranging from budget spending to extravagant handlings depending on the degree of your expenditure. However, for those who want to travel, shop and enjoy pocket wise, there are options too (although the entertainment is limited). Dubai has shockingly numerous things that you can enjoy for free or almost free. 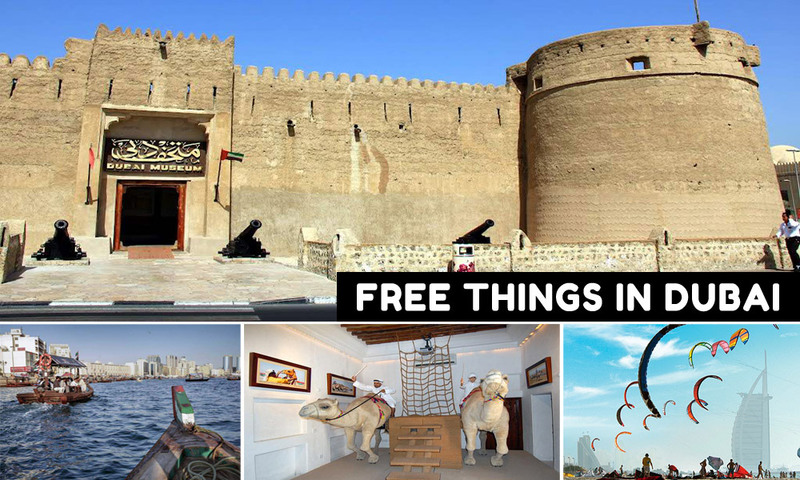 Here revealed are the free things to do in Dubai, which are free or almost free. Dubai Museum is a great attraction of the city, which offers tourists insights into the transformation of the city from a sluggish port to an oil-rich state and from a sand dune terrestrial to a dynasty of skyscrapers. The place charges you less than one dollar. This is the great place to enjoy the dioramic display of Dubai’s excavations before the discovery of oil and other artifacts. It models the step by step transformation of Dubai from a sandy territory to one of the glitziest conurbation across the globe. Not a completely free things to do in Dubai, but a trip to Dubai Museum is not going to cost you a fortune either. If you ever wanted to know anything about camels and to a get an authentic traditional experience of Dubai, the Beit Al-Rekkab or The House of Camel is one of those places that offer you a true ambiance of historic Arab. The entry to Beit Al-Rekkab is absolutely free. Famous as the ‘Camel Museum’, Beit Al-Rekkab celebrates the deep involvement of camels within Arabic culture. The museum displays skeletons of camels and other type of portrayals related to the life cycle and transportation use of camels. It is located at Al Shindagha and remain open from Sunday to Thursday between 8am to 2pm, so be ready to avail this free things to do in Dubai. One of the most beautiful way to see the Dubai city is through water. Trip aboard an Abra (a small wooden boat), to transport across the Dubai Creek. Abra remain available from 6 am till 12 am and hardly charges you 1 Dirham. The shortest Abra trip is about 5 minutes between Deira and Bur Dubai. Through Abra you get a chance to enjoy the calmness of emerald green oceanic water and to get the best sight of the high-rise skyscrapers of Dubai standing along the shoreline. You can also hire a private boat with your partner to enjoy the amazing views of Dubai Creek at night. It is also one of the recommended activities for couples in Dubai. Undoubtedly, Dubai has the most highly priced restaurants such as Burj Al Arab and Al Mahara that can cost you around $320 just for menu savoring; however, there are a lot of options to the other side of the band. For authentic and inexpensive Asian and Arabian food, move to Al Diyafah Street and visit Al Mallah there as here you can find Shawarma, lamb and kibbeh as cheaper as a buck. Al Mazmar Beach Park is encumbered with barbeque places, playgrounds, swimming pools, showers, rides, etc. and it charges you just $1.30. You may go there with your family and children to enjoy a low-cost quality time (Monday & Wednesday are dedicated to female visitors only). You may also go to Woollongong or Kite Beach to enjoy watching, kite surfing as the entry is free, however there are limited amenities. Al Mazmar Beach is also a home of surfers and there are plenty of surf shops in Dubai, where you can buy accessories for surfing. These are some of the options for budget travelers in Dubai for free or let say at the lowest possible cost or. Yet you could find more while exploring the city. If you’re on a short trip to Dubai, you can also consider staying in the budget hotels near Dubai Airport. To recommend a free things to do in Dubai for budget travelers, please add comments below.